This tapestry image is by Charles Le Brun from 1662 and was originally intended to hang over a door in a formal interior. The stunning details in this work is representative of this French painter who had an imagination as well as an eye for unique works of grandeur and that appeal to the imagination. Le Brun started painting at the age of seven and at fifteen already had commissions from Cardinal Richelieu. Subsequently, Louis XIV ennobled Le Brun to become the illustrious First Painter to His Majesty and had the King declared him "the greatest French artist of all time". 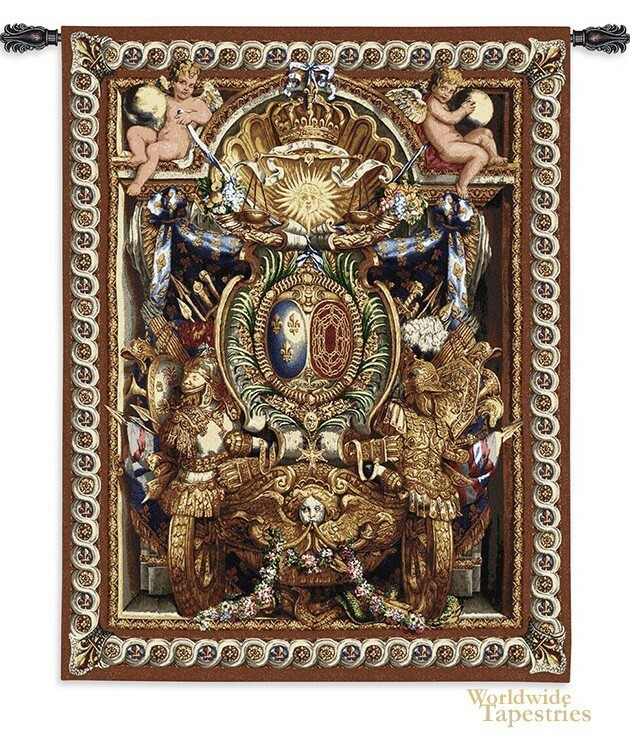 In this tapestry "Portieve Du Char" we see emblems of royalty with symbols of power and grandeur such as masks, trumpets, flags, spears, flowers and the crown surrounded by cherubs holding the globe, which can be interpreted to an insight in how the royalty were viewed at the time. This work is an elaborate composition to decorate palaces and rooms of importance, and is a glorious expression of art in the 17th century. This tapestry "Portieve Du Char" is backed with a lining and has a tunnel for easy hanging. Note: tapestry rod and tassels, where pictured, are purchased separately. Dimensions: W 53" x H 70"